Two chairs, each with a ball. 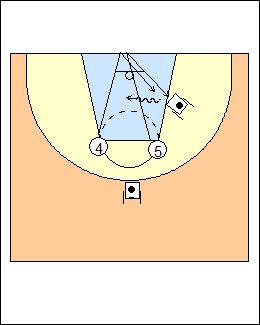 4 and 5 start from the elbows, on "go" sprint to touch the baseline with a hand, the first player to get to the chair at the low post is on offence (here player 5), limit of 3 dribbles. 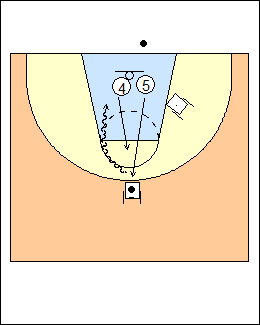 See Post play - Florida 1 on 1, 1 on 1 - Florida finishing. On a score, 5 stays on offence and gets the ball at the top of the key, or 4 gets the ball if he made a stop on the first possession. See 1 on 1 - From the top.